Do you feel like it's impossible to lose weight with Hypothyroidism? ​It actually isn't impossible and I will explain how later, but first I need to share a story with you. ​I had a patient who came to see me in the office recently. Like most other people, she had tried to lose weight following every diet you can think of, but nothing seemed to work for her. So I got to testing her labs. And THAT was her primary problem. Her thyroid wasn't all that bad, she ultimately did better on Armour thyroid - but her main problem was the insulin. Once we got her on the right regimen, cleaned up her diet, fixed her adrenals, replaced nutrient deficiencies and put her on a fasting program her weight started to shed off. And that's what we are going to talk about today. ​Hypothyroidism and Insulin Resistance. And why it's impossible to lose weight unless you address BOTH issues. Insulin is the hormone that increases after you consume sugar or carbohydrates from foods (1). It puts sugar inside your cells and protects your body from high levels of sugar in the blood. That's what it's supposed to do - when everything is working correctly. When insulin levels remain chronically elevated (like when we eat a lot of sugar in our diet), your body becomes resistant to insulin. And that's where all the problems start. High levels of insulin cause you to store the calories you eat from your diet as fat in your belly. ​So high levels of insulin = you gain weight (even if you eat fewer calories). If you count all of the people with Hypothyroidism you get pretty close to about 1 in 20 adults in the US (2). It's INCREDIBLY common. ​Not only are they both common, I find that most Hypothyroid patients are ALSO suffering from insulin resistance on top of their Hypothyroidism. Is Insulin Resistance Sabotaging your Weight Loss Efforts? ​Identifying and diagnosing insulin resistance is the first step to treatment. 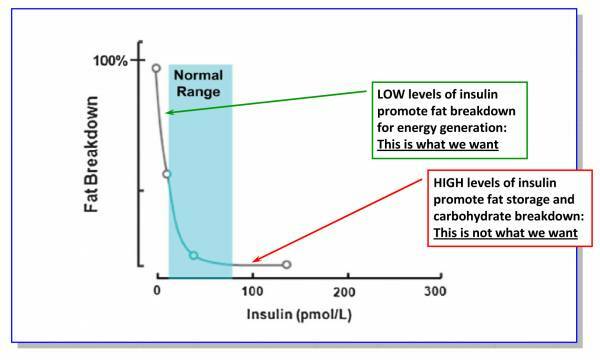 To understand why reversing insulin resistance is critical to weight loss we have to talk a little bit about physiology. ​We already mentioned that in the presence of insulin your body will store all calories you eat as fat. When insulin levels are high, your body is unable to burn your fat cells as a fuel source. This process is mediated through a hormone known as hormone-sensitive lipase (4). So, in order to burn fat (and actually lose weight), you HAVE to reduce insulin levels. As insulin levels fall, your body is able to actually unlock your fat cells and start to burn them for energy. When insulin levels are high, your body can't unlock your fat cells to use as energy. As Glucose levels drop in the blood your body tells your brain to increase your cravings for sugary foods, it also makes you irritable, and sluggish. Are any of these symptoms sounding familiar? Now that you understand how insulin works, you need to understand how your thyroid interacts with insulin. Thyroid hormone, specifically T3 thyroid hormone, has an impact on how sensitive your cells are to insulin. The lower your T3 is the more likely you are to develop insulin resistance. On the flip side, the higher your T3 is the more likely you are to develop insulin resistance as well. This means that both states of hypothyroidism AND hyperthyroidism can lead to or exacerbate insulin resistance (5). But, in addition to this, insulin resistance also seems to play a role in altering how much thyroid hormone your body is capable of producing. Both insulin and thyroid hormone play together in a bi-directional way. One always impacts the other which means that BOTH are important. The good news is that most of you reading this probably fall into the category of hypothyroidism (meaning your thyroid hormone or T3 is too low). If you fit into this category, you will most likely have trouble losing weight because your low T3 is contributing to the development of insulin resistance. You MUST address your thyroid if you have any hope of reversing insulin resistance in your body. If either of these values is low (regardless of what your TSH is) then you need to address this problem by either altering your medication or by undergoing natural therapies. So How do you Know if you have Insulin Resistance? Diagnosing insulin resistance is actually pretty easy once you know what you are looking for. The problem is that most Doctors will NOT be ordering these tests at baseline. So, in order to get the proper evaluation, you may have to ask for and interpret your own tests. I can walk you through it. Believe it or not, diagnosing insulin resistance can be very difficult when in doubt I would recommend that you consult with your Doctor - just make sure you find one that is knowledgeable. Despite what conventional medicine would have you think, insulin resistance IS treatable. In the conventional medical world, treatment is targeted at blood sugar. The problem with that method is that you are only going after the symptom of insulin resistance. Blood sugar rises as insulin resistance increases, and when it gets too high that's when Doctors diagnose you with Diabetes. But diabetes is really just advanced insulin resistance. I briefly touched on what you need to do earlier in this article but I want to go over it again in a little more detail here. Before you move on to any of the next steps you need to make sure that your thyroid is optimized. If you are taking medication then this means ensuring that your lab tests are in the "optimal" range. If you are not taking medication, or if you are having a hard time getting on thyroid medication, then you can always use natural therapies such as these. But for most of you, you will probably need to look at your medication. And when it comes to treating insulin resistance, most people do well on thyroid medications that contain the hormone T3. Medications such as Cytomel, liothyronine, and Natural Desiccated Thyroid hormone tend to help the most both in terms of weight loss (6) and in helping normalize insulin levels. Do not take more T3 than necessary because taking too much may actually make your insulin level worse! In addition to addressing your thyroid, you MUST also take into account other factors such as your diet (the foods you put into your mouth), WHEN you eat, how much you eat, which supplements you take, and what medications you are on. Diet i​s important in reversing insulin resistance, but alone it is usually not enough - especially for advanced insulin resistance. What you put into your mouth can certainly cause an increased level of insulin and ultimately lead to insulin resistance. However, once insulin levels get high enough they can cause insulin resistance by themselves in a vicious cycle. That's why diet is a good first step but usually not enough. I recommend focusing on a nutrient-dense, real whole-food diet, low in refined carbohydrates and sugar. You can get an exact idea of what I'm talking about by checking out my thyroid reset diet here. Everyone knows exercise is important, but the type of exercise matters a lot. Especially if you are trying to lose weight and reverse insulin resistance. Studies show that high-intensity Interval Training is especially helpful in sensitizing your body to insulin (7). ​In addition, you can get more bang for your buck in a smaller amount of time. Not sure what high-intensity Interval Training (HIIT) is? ​HIIT focuses on small bursts of all-out, maximum effort for about 30 seconds followed by 60-90 seconds of moderate activity. This process is repeated 5-8x in a single session at least once per week. ​This once per week activity is more beneficial to your body than doing an elliptical for 30 minutes and takes a much smaller amount of time. Do not attempt high-intensity interval training unless your thyroid hormone is optimized and your adrenals can handle the stress. Exercise (of any kind) puts a physiologic strain on the body. And this is a normal part of the healing process which causes the release of endorphins and cellular changes which lead to all of the benefits of exercise. Quick Tip: If after exercising you are fatigued for several days then that is a sign you need to look at your thyroid and/or adrenal function. Exercising should make you tired and sore, but it shouldn't last more than 3 days. Fasting is a 4 letter word for a lot of people. But the truth is that fasting is probably the single most effective way to treat insulin resistance (8). The longer you spend without eating the lower your insulin levels fall. Once your body uses up the majority of stored glucose in the liver, your body MUST use triglycerides from your fat cells to provide your body with energy. As insulin levels fall your fat cells become "unlocked" by hormone-sensitive lipase, and you are now burning fat for fuel and sensitizing your body to insulin in the process. This is obviously oversimplified, but you get the point! Like high-intensity exercise, I don't recommend starting intermittent fasting unless your adrenals and thyroid function are optimized. ​Do not attempt fasting if you are on insulin and a diabetic. You WILL need medical supervision and if you try to do it by yourself you may put yourself in danger from hypoglycemia. Eat an early dinner at 7pm. Eat a late breakfast/early lunch at 11:00am the following morning. I saved this part for last because it's typically the first thing people want to do! While supplements can definitely help reverse insulin resistance and help you lose weight, they should NEVER be used in isolation. If all you do is grab your supplements and go, you will not experience the results you are looking for. Berberine - I recommend using 1,000mg at least daily. Berberine has been shown to be as effective as Metformin in reducing Hgb A1c (9). Pure Lean PurePack - This has a combination of Cinnamon, Alpha lipoic acid, Chromium and Green tea - all of which have been shown to decrease insulin resistance. I use this because it puts everything in a nice convenient to use package and includes other helpful nutrients that most people are deficient in. Konjac root - This supplement is a viscous fiber that expands in your stomach helping to keep you full, feed good gut bacteria and reduce insulin resistance. It's also been shown to actually help with weight loss (10). For maximum benefit take 4 capsules 15 minutes before each meal and while intermittent fasting throughout the day. We are going to put this all together at the end for maximum effect, so keep reading. Do you have debilitating fatigue? When trying to add these tips to your regimen it's VERY important that you don't do more harm than good. Before you start doing high-intensity interval training or intermittent fasting you need to make sure that your thyroid hormone medication is optimized and that your adrenals can handle the stress. If you aren't sure whether or not you should start I would recommend you check out this post here. If you are still having hypothyroid symptoms, or the signs and symptoms of adrenal fatigue I would caution against exercising and fasting. Also, take note that there is a difference between brain-based fatigue and physical fatigue. In brain-based fatigue, you will get fatigued after heavy thinking or mental activity. If you are experiencing this type of fatigue then exercise CAN help. In physical-based types of fatigue, you will be wiped out after exerting yourself physically. If you are experiencing this type of fatigue then exercising and fasting may make your condition worse. Putting too much strain on your adrenals can lead to excess cortisol and weight gain. You can learn how to test your adrenals and cortisol levels in this article. In addition to supplements, there are some medications that can actually help sensitize your body to insulin. Most of the time this won't be an issue if early insulin resistance, but if you have diabetes (and advanced insulin resistance) you may be on 1 or more medications. Metformin - Metformin is cheap and can be effective if used early on. Acarbose - Acarbose helps reduce the amount of sugar you absorb from your foods and can be helpful for some people who have trouble resisting sweets. SGLT-2 Inhibitors (11) - SGLT-2 Inhibitors help your body eliminate extra sugar by causing you to urinate or pee it out. GLP-1 Agonists - GLP-1 Agonists like Victoza are probably the most powerful medications at reducing insulin resistance. They are also very effective in helping people lose weight and keep it off. ​Other medications may actually cause an increase in insulin (especially if they stimulate the release of insulin). ​You won't start feeling better and losing weight unless you take ACTION. Change your diet: You have all of the resources here to make it happen in this insulin resistance diet guide. My guide has all the guidelines including what foods to eat, what foods to avoid and what portion sizes you need. Balance and check your hormone levels: Insulin resistance is made worse by other hormonal imbalances like increased levels of leptin. You can find out what hormones I'm talking about here and how to go about getting the right tests. Get your supplements and start using them: These are the supplements that I recommend and use in my clinic - Berberine, Purelean Pure Pack, Konjac root. Use these in combination with the other therapies listed here for the most benefit. Consider adding intermittent fasting and HIIT into your regimen (advanced): Use caution when adding these into your routine. I recommend starting with the other options above first. ​Are you suffering from Insulin Resistance as well? How did you manage to lose weight and fix the problem? Hypothyroidism and Diabetes can be a tricky situation so let's share the information to help as many people as possible.